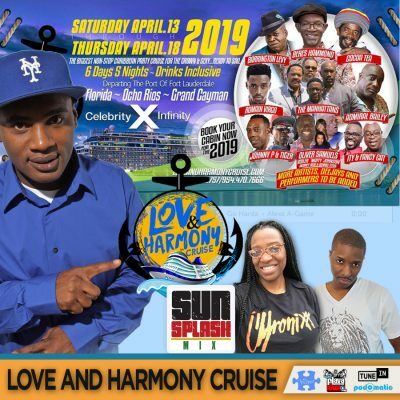 Today Jabba gives our Sunsplash Mix listeners some exclusive information about the Love and Harmony Cruise 2019 so book today because only a few cabins remain with great payment plans. A stellar first artist line up for #lhc2019 including Beres Hammond – Barrington Levy – Cocoa Tea – The Manhattans – Romain Virgo – Johnny P – Tiger – Admiral Bailey – Ity and Fancy Cat – Oliver Samuels and much much more! This year there will be a few new attractions: A Concert on the Beach, A Beach Party, and A Live Theatre Play! Sunday, April 14th – At Sea. Wednesday, April 17th – At Sea. Thursday, April 18th – Return to Fort Lauderdale, Florida 7:00 am.